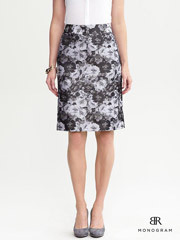 A refreshingly different pencil skirt silhouette. Gorgeous back detailing and curved hem. A hidden zip closes the side. 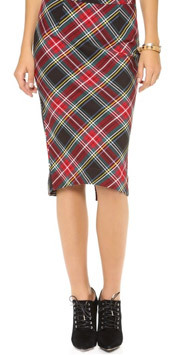 The tartan is soft but unlined so consider yourself warned. One of the best pencil skirts around. Great longer length, and interesting panelling and piping detail. It’s made of a brilliant non-crease textured fabrication. No creases after sitting at the office all day. Looks better in person than on the photo. Another extremely on trend look for Fall and Winter. Match it with booties or ladylike pumps, and with something soft and cuddly on top. The faux leather looks very faux, like plastic. But I’ve come around to thinking that’s a fun look in itself. Polyurethane fabness. Why not? Trendy and fun matched with a soft upscale sweatshirt or cropped cable pullover. Great twirling ability as it balances romance with edge. Sits lower on the hip and runs large. Read the rave reviews. This skirt is also available in petite sizing. A watercolour floral midi that’s just as on trend as it is retro and classic. I love it when classics become trendy. Surprisingly, the pleats on this skirt lie quite flat around the waist and tummy, and there is plenty of length. Just beautiful and ever so romantic. 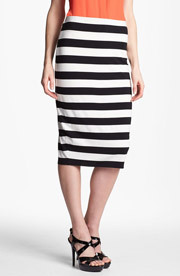 It sold out at the Flagship Nordstrom in Seattle in a few days, we are that starved of this style of skirt. 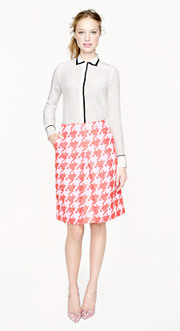 I love this boldly patterned graphic skirt. Comfortable and forgiving. Fabulous length and a good fit, although it might run a little big. Wear it with a casual coloured moto jacket, add a simple layering top and throw in some fun arm candy. Looks fab with a mesh sweater. Or pair it with a boxy untucked blouse for a de-bombshelled effect. 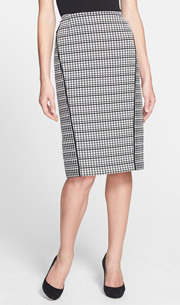 This machine washable pencil skirt has a nice bit of length to it. The cheerful large floral print in beautiful red, coral and pink shades looks lovely against the black background. Great for work with a metallic sandal or pump, and a classic blazer or moto style jacket. But also sweet for a casual party or running around town on weekends. 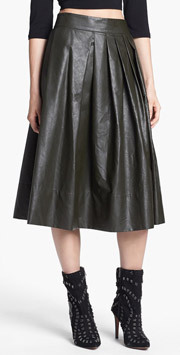 This A-line skirt with inverted box pleat launched me into orbit! With the oversized houndstooth pattern in red and lavender it’s a gorgeous modern take on a classic silhouette. Graphic and ladylike. It’s a good length for regular length gals and also comes in petite sizing. The colours are a little more vibrant in real life than on the computer screen. 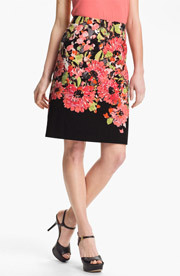 A great length pencil skirt in an on-trend floral pattern. The black and grey give this fully lined skirt a photographic vibe. Dress it up for workdays with a crisp blouse and jacket. Or wear it casually with a cheeky denim shirt or sassy sweatshirt and fun flats. Runs true to size. Only available online. 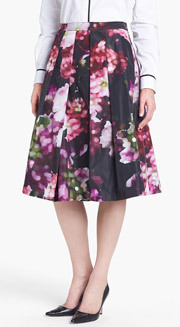 This fab floral skirt is very similar to the solid-coloured version that was such a big hit with YLF readers last year. It’s comfortable, forgiving and has a great midi length. 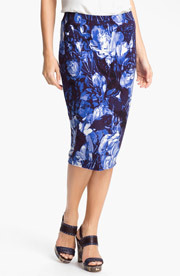 The cobalt blue floral pattern is chic and eye-catching. Wear it with a boxy untucked shirt or sassy sweatshirt for a de-bombshelled look. Add a pair of sandals, pumps or oxfords and off you go.